Can you guess what they're made of? Rattlesnake rattles -- Melissa got it right. They're available at the Bone Room. 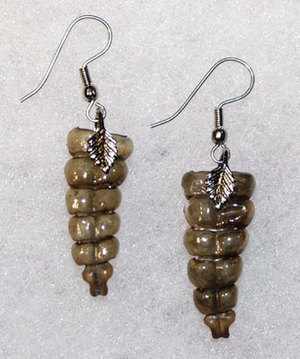 Rattlesnake rattles! Hoo boy, them's some fine western-wear right there. Goes with a nice pair of rattlesnake boots. Dragon Scales imported from Middle Earth? Monster teeth recovered from Cloverfield and selling on eBay as earrings? wow they look cool. but who's killing all the rattlesnakes? You don't have to kill them. Just catch them, keep firm control of the dangerous end and pop a few rattles off the other end. Never pop all the rattles off, that's a serious disservice to whoever encounters the snake next. I used to live right down the street from that store in Berkeley - it had the coolest insect collections and random natural history stuff. I always thought there should have been a stuffed alligator hanging from the ceiling, 'cause that's what shops like this usually have in books..
Also there are plenty of rattlesnakes that die a natural death . . . I grew up in Texas.